Following the decision passed by the executive committee of the ruling party, the Ethiopian People’s Revolutionary Democratic Front (EPRDF), Ethiopia’s new reformist Prime Minister, Dr. Abiy Ahmed, announced that Ethiopia would accept the 2002 United Nations backed border demarcation, paving the way for peace between the two nations. Dr. Abiy Ahmed then paid a historic visit in July to Eritrea, during which he and President Isaias Afwerki of Eritrea signed a declaration ending 20 years of hostility and restoring diplomatic relations and normal ties between the countries. President Isaias Afwerki reciprocated with a state visit to Ethiopia just days later.In addition to fully implementing the 2000 Algiers Agreement, which requires implementation of the boundary decision, the two parties agreed to end the state of war; to forge close political, economic, social, cultural, and security cooperation; to resume trade, economic, and diplomatic ties; and, to work on regional peace. Following this, embassies reopened, phone lines restored, and airline flights between the two countries have resumed. Eritrea was once a part of Ethiopia and comprised its entire coastline on the Red Sea until it voted for independence in 1993 after decades of war. This situation left Ethiopia landlocked and diminished relations following another outbreak of the war in 1998 forced it to direct its foreign trade through Djibouti. The historic peace agreement could transform economies, politics, and security in the volatile Horn of Africa region, which lies along one of the world’s busiest shipping routes and is plagued by conflict and poverty. For Ethiopia, the dividends of peace would be an end of tension along its northern border and an alternative outlet to the sea via Eritrea. Ethiopia has seen double-digit growth in recent years and is looking at wider options for importing and exporting goods, for which Eritrea’s ports will play an astonishing role. On August 9 2018, Ethiopia and the United Arab Emirates (UAE) have agreed to develop Assab Port and build a pipeline connecting Ethiopia to the Eritrean Port of Assab. The UAE, which is reportedly using the Assab port to conduct military operations against Houthi rebels in Yemen, has been acting as a key mediator between Ethiopia and Eritrea. As stated above, the reopening of this port and Port of Massawa in northern Eritrea would benefit landlocked Ethiopia and its growing economy. The historic peace agreement could transform economies, societal relations, politics, and security in the volatile Horn of Africa region. The people on both sides of the border Ethio-Eritrean border are closely linked by history, language, and ethnicity. At a cultural level, the war damaged many families separated across borders. Families lost loved ones with husband and wife and even children and parents separated by the war. The future of Ethio-Eritrean relations could now be improved by social reunification and increased stability. The peace agreement would reunite shared socio-cultural and religious activities, many of which go back centuries. From a security perspective, Ethiopia will gain relief from Eritrean subversion, with rebel movements deprived of a rear base from which to attack the government of Ethiopia. Ethiopia routinely accuses Eritrea of supporting Ethiopian rebel groups, which following the reforms, most of them declared a ceasefire. Moreover, the security threat from Egypt and its intent to use Eritrea as a base to destabilize Ethiopia over the contentious issue of the Nile water will now be diminished. Furthermore, Eritrea’s accusation of Ethiopia’s support to Eritrean rebel movements based in Ethiopia will come to an end. Eritrean authorities may also have opportunities to adopt tangible reforms at home and toward the region. Previously, Eritrea had used the threat of Ethiopian aggression to justify repressive policies, including an indefinite national military conscription, which is seen as a key driver of migration for hundreds of thousands of Eritreans. Many expect the open-ended military conscription to end and usher in a change in the daily lives of citizens by putting an end to decades of human right violations. What the Peace Agreement Means for the Horn of Africa? Regionally, the prospect of peace between Ethiopia and Eritrea is likely to have a positive effect on the Horn. The development has potential to transform the region into a united economic powerhouse. Regional efforts to integrate economically have already been started by Ethiopia and Djibouti. Prime Minister Dr. Abiy Ahmed has reached an agreement with Kenya to partner on port development projects. The Premier has also signed similar agreements with Somaliland and Somalia. 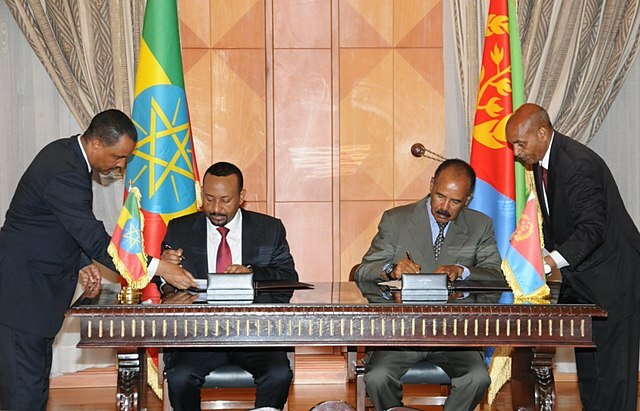 In the same vein, Ethiopia and Eritrea have reached an agreement on development. However, a revived relationship between Ethiopia and Eritrea poses a challenge to the increasing dominance of Djibouti, who had benefitted from importing and exporting the vast majority of Ethiopian goods. To capitalize on Ethiopia’s interest, Djibouti has borrowed massive money to build large-scale infrastructure projects such as a port and a railway. However, the rapprochement between Ethiopia and Eritrea has weakened Djibouti’s comparative advantage in the region, putting it in a precarious economic position. Since 2008, when Djibouti accused Eritrea of occupying the disputed Doumeira Islands and holding Djiboutian prisoners, the hostile relationship between Eritrea and Djibouti has been another challenge to navigate. For example, Djibouti responded angrily when the President of Somalia noted during his recent visit to Eritrea that the United Nations should lift sanctions on Eritrea given its commitment to conflict resolution. However, as Eritrea and Djibouti currently maintain good relations with Ethiopia, the Ethiopian government could use this opportunity to serve as a mediator to help resolve the problem between Djibouti and Eritrea peacefully. This may have a positive effect on the regional stability and integration. Finally, the peace agreement will also help the overall peace architecture and work of the Intergovernmental Authority on Development (IGAD), an East African regional economic community of which both countries are members, and improve IGAD’s role on peace and security and regional integration. As the details and implications of the peace deal develop, the full benefits remain to be realized. However, the long-term consequences could benefit both countries and region as a whole. IGAD member countries include Djibouti, Ethiopia, Kenya, Somalia, Sudan, Uganda, Eritrea and South Sudan. Dr. Getachew Zeru is an Assistant Professor at the Institute of African Governance and Development at Ethiopian Civil Service University, Addis Ababa, Ethiopia. He was a former Southern Voices Scholar Network for Peacebuilding in Spring 2015.